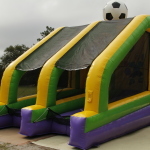 PK Shoot-Out is great for Festivals, events and birthday parties! Test your soccer skills with the amazing PK Shootout™! 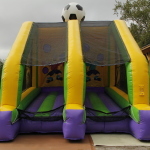 Each player tries to kick their soccer balls past the goalie causing the ball to come out on their opponents side! First player to get all of the soccer balls to their opponents side wins! This fun game is available by itself for $125 or can be rented as an add-on to another rental for $75.